This review is concerning the assisted living section. The apartments are nice, housekeeping and maintenance do a good job as well. The food is average to poor. The food has to be brought over from the main kitchen on the independent side and is often cold by the time the resident receives it. The big problem is nursing! Most of the nursing staff is incompetent. Medication errors where rampant and staff was often short of help. There is one really good nurse and she was constantly working double shifts and fixing he mistakes the other nurses made. Keep your loved ones away form Amberleigh's assisted living. I am writing this from what is likely a unique perspective. My brother and I (both of whom live out of state) toured many places before deciding that Amberleigh was by far the best place for our parents, and we moved them here 2 years ago. They were very happy. My father passed away several months ago and I have been living with my mother since then, to get her over the hump, so I can speak as a resident. I think Amberleigh is great and I recommend it to everyone, without any reservations whatsoever. Everyone here is great, including the administrative staff, the kitchen staff, the housekeeping staff, the maintenance staff, the front desk staff, and the activities staff. They are all friendly, helpful, and accommodating. I have on a number of occasions asked for some sort of maintenance help and it is done promptly, sometimes as soon as I ask. The food is very good, and you get a weekly menu at the beginning of the week. If you don't like what is on the menu for some particular meal, there are many alternates to choose from - just call down and request it. There is also a regular residents' meeting where residents can voice any concerns they have. There are enough activities to keep anyone as busy as they'd like to be: exercise classes, movies almost every night, bingo twice a week, a speaker series on Monday evenings, live musical entertainment at least several times a month, trips to concerts, restaurants, etc., picnics in the summer with live music - there was even a brass band for one of the holiday celebrations! The washers and dryers in the laundry rooms are free (and there are elevators and rolling baskets so you can get your laundry from the laundry room to your apt), or you can opt to have your laundry done for a small fee. There is a beauty salon that is open M-F, a small store for buying essentials and goodies, a computer room, a private dining room for private parties, a number of lounges on each of the floors, a billiard and ping pong room, and rooms with storage lockers. Transportation to medical appointments is provided, as are trips to the grocery store, Wal-Mart, etc. There is a seamstress who comes in several times a month, an audiologist, and a podiatrist. It is also a very friendly community - I have gotten to know many of the residents here and they are delightful. Finally, Amberleigh has 3 levels of care: independent living, assisted living, and memory care. I only wish we had moved my parents here sooner. So my grandmother has been a resident at Amberleigh for over two years now, and she is always telling me how much she loves it there. She always tells me about her friends, all of the activities they do, and even how wonderful her hairdresser Lisa is (They have a hair salon right off the Lobby). So After finally visiting her today I can see why she likes it so much. It was my first time in the facility ( I am on the West Coast and don't get home very often) and I have to say the place is quite impressive. Today the staff brought in a local elementary school for a holiday band/chorus concert which I thought was pretty cool. My grandmother and her friends were very happy, which was evident by the smiles all around. After the concert was over we went in to have lunch. Even I was impressed with the food, the atmosphere, and the friendly server. I am a very picky eater, and they even made me a grilled cheese and french fries! Every single staff member that I encountered today was overly friendly, and I also thought it was pretty cool how I saw their Director walking around talking with the residents a few times throughout he day. According to my Grandmother, the new Director (or Administrator, or whatever they call him) is pretty new to Amberleigh and she really likes this guy. She says he reminds her of me, so he must be a pretty good guy. All jokes aside, I am very happy that my grandmother is living in a place like this, it was nothing like I thought it would be. I would say if you need to have a loved one live somewhere like this, check this place out. I never leave reviews for anything, but I felt obligated after seeing how great they are treating my grandmother. We have been very happy with the overal care of this facility. The employees are very happy and always ready to assist. Place is clean always and the amentites are well worth the price. Dad has been very happy and they always keep the folks happy. My mother lives in Independent living and is now in need of a little more help. I toured the Assisted Living side of the building and what an amazing experience. My dealings with Elaine and Joy in marketing were very informative and they are very understanding and patient with all of my questions. The assisted living side of the building is bright and cheery. I met the director, Pam and sat with her. she was very attentive, answered all of our questions, and really made us feel like this was home. Her professionalism and dedication is contagious through my meetings of the rest of the staff. All of the staff were welcoming and greeted us with smiles. The building was clean and there no odors like I have experienced in other facilities. The dining room is cozy and had a great menu selection. The activity calendar is full with a lot of options. Residents look very happy. We are excited about our upcoming move. I didn't care for The Amberleigh too much. My visit with them was long. It's a lot of walking and I didn't really care for what I was shown. The staff was very pleasant, but I was not impressed with the property. The dining area was fine and I saw a lot of card playing. The Amberleigh has a room with some different equipment in it, like a hydro bath where you could transfer from your wheelchair into it, and water jets help your legs for circulation. The location was perfect. They were getting ready for a Bill's game when I visited; everybody was up for that and they had decorations, so it was a very nice atmosphere. The person who gave us the tour was very knowledgeable and answered any questions we had, so she was an excellent representative for their facility. We visited Amberleigh, but my mom didn't like the place. When we drove up, the residents were wheeled up and parked outside taking naps, and she was turned off by that. It was more institutional and larger than other facilities. The staff was friendly enough and accommodating. However, they were not very flexible with what they offered or were willing to do. The amenities at The Amberleigh were very good. They had a physical therapy room and dining area. I was told they had transportation for the residents, and I saw the list of activities. I visited a friend of mine at The Amberleigh, and it is a very nice place. I would not mind living there, as well. Her apartment is lovely and very spacious. I have tried their food a couple of times, and it is very good. The people I know who live there are extremely happy. I have found my Dad's stay at The Amberleigh very satisfying. As a child it is always hard to see your parents sell the family home and move out! I can say we haven't looked back since he has been there [May 2017]. After my Mom died he was alone, there he has friends and is social. He fell in his apt. over the summer and activated his pull cord and the Security guard was in his room calling me to let let me know what happened. My Dad will tell you how he has put on 20 pounds since he has been there, he LOVES the food! My mother currently lives in Independent Living and is need for a little bit more help these days. We have decided to stay with this Community and move her to the attached Assisted Living. My dealings with Elaine and Joy in Marketing have been absolutely amazing. they are both very knowledgeable, helpful, and understanding of our situation. I was able to meet and speak with the Director of Assisted living, Pam, and was even more put at ease about this tough decision. She put all of our fears at rest. She is thorough, extremely caring, and I can tell all of her residents are her first priority. the Building is bright, cheerful, and above all clean. There were no odors as I have found in other facilities. all the staff I came in contact with were friendly. There is a wonderful dining room, full activities available, and spa tubs for the residents to use. I can tell already this is the right choice. had looked at Amberleigh a few years ago and my father was not ready to make the move. We decided to go back and take another tour. It started out on a good note and ended even better!! The building is beautiful with a fresh face, new décor and carpeting. The atrium area is great. So much going on and lots of residents laughing and seem very happy. Elaine gave a fantastic and informative tour. She answered every question my father had. As we were on the tour, all of the residents stopped and said hello stating how much they like living there. We stayed for lunch and it was very good. They staff is A++! Everyone had a smile and stopped to greet us. They really had a way of making us feel at home. You can see how the staff interacts with the residents and it was very endearing to watch. The director Jon had a great talk with my father and his warmth added into our decision. The calendar was packed with many different things so he can take part in what he chooses to. By the end, my father was sold! Not just on the building, the great apartment size or the staff the whole atmosphere. We are thrilled that he moved in and things are going exactly as we thought... AMAZING!!!!! Our father has enjoyed living at Amberleigh. To begin, the sales director was overbearing and lacked a feeling of genuineness but the rest of the staff made up for that. The apartment is quite lovely. Especially the balcony looking over rose gardens. Staff couldn't have been nicer. Servers, housekeeping and maintenance were great. The community director always friendly and on top of every detail. Our father was impressed with the upgrades but feels that the building should have a generator for the elevators in cases of emergency. (Administration was left to aid hundreds of older people once without the corporation budget to get them one.) He's moving to a higher level of care now and will miss the old days when it was a real homey, well run place. The staff at The Amberleigh was very nice, very accommodating, very friendly, and very thorough. They had lots to offer, including assisted living and memory care. They had everything, like vans that take them to doctors, to the stores, and everywhere you want to go. They've got a ton of clubs like bridge clubs, card clubs, puzzle clubs, crafts clubs, movie clubs, a variety of religious services, personal trainers, OT and PT services, and a volunteer club where they were making blankets to give to babies. The staff was very interactive and very outgoing with the residents. They had a Halloween party going on when I went. They were dressed up in costumes, and they let the residents vote for the best costumes. They had music going. They had a very full active calendar. The staff seemed to interact with them throughout. They had high school students working there which the residents just love. They had a wide variety of food and a variety of hours for them to go for breakfast and lunch where you pick off of a menu. The admissions staff at the Amberleigh promised my family a lot, progressive care on higher as needed, available staff to hire for extra help, high level of personalized care. The difference between the promises and reality was shocking. When I asked about progressive care I was told it isn't offered, when I asked about hiring and paying for extra coverage they said it wasn't offered by the Amberleigh. The facility is clean and well maintained but really it is only for independent and higher functioning people. In the end my family was extremely disappointed with our experience and shocked by the misrepresentations of their sales staff. The Amberleigh's rooms were a bit nicer than others, and you had a choice of having a little apartment where you have a separate living room or sitting area and a separate bedroom, or you could have a glorified hotel room. It was newly remodeled and the bathroom had a nice wooden cabinet where you could store some things, plus a nice counter at the sink. They had an activities room and did outings in the local community. They had bingo, clubs, and a separate dining room if you want to hold a private party for family. They had a nice dining room, just like a fancy restaurant. The people were very friendly, very respectful, and caring toward the elderly residents. There was a separate entrance to go into the memory care if you wanted to, which was a nice feature. My mother-in-law was at Amberleigh, and about 2 weeks later, she fell and had to go into a long-term healthcare facility. But at the time she was there, I thought it was very good. She was in an apartment, which was very large, and it was brand new, so it was excellent. They had arts and crafts and music. She was really too far gone to take much advantage of them. We are happy with the appearance of Amberleigh, the staff, the back courtyard, and the whole feel of the place. The staff was very accommodating, and the accommodations are great, so we were very pleased. The food was very good. They have a chef on staff that makes everything great. The dining room is large, nice, clean, and comfortable, and the service is great. I stopped in for a tour and immediately fell in love with Amberleigh. The warm friendly atmosphere made me feel at home right away. I was impressed with how the staff interacted with the residents and greeted them all by name. I knew right away that Amberleigh is the perfect place for my father. I'm sure that he will look forward to joining their Men's club and all the various activities and outings. I have a family member who lives at Amberleigh, and she has expressed multiple times to me how much she dislikes it. Not only is her apartment a FAR walk from any door, but the environment is like walking through a hospital hallway (bland color, bare walls). She despises the meals, claims the steak is more like cardboard, despite when she moved in originally they were tolerable. I have to wonder if the new management is responsible for the decline of this community, and how they have money to transform into an assisted living facility and advertise on tv when they can't afford to improve the quality of their meals. On top of that, the annual summer picnic that has ALWAYS been free for family members now requires a fee. This place actually disgusts me, and I would not recommend anybody to this facility. Mom really liked and felt comfortable in The Amberleigh. It has a homey feel as soon as you walk in and a warm and inviting atmosphere. The lady who showed us around was very pleasant. The decor and rooms were very nice. It had a salon, an exercise room, a community room, group activities, and outings for residents. The Amberleigh was very nice, but the residents were a lot older than me, so I don’t think I will go there for the next five years. The staff was very nice too. I would absolutely recommend this facility to other people as long as they can afford it. They have cards and exercises and all kinds of activities that most facilities offer. The rooms and apartments are very nice. The Amberleigh was very nice. The people were friendly, the location was good, the grounds were well-kept, and the staff was very friendly and helpful. I looked at the one- and two-bedroom apartments, and I liked both. Their costs seemed very much in line with everybody else's. My mom was at Amberleigh for two years. The people were very friendly, and it was very well-kept. She didn't like the food; she wants good cooking, not industrial. The room was very sufficient and very well-maintained. They did everything -- bingo, board games, sing-alongs, a lot of outside singers who visited, weekly mass, weekly non-denominational services, and celebrated Jewish holidays. They were a good community. I liked the country setting of The Amberleigh. It was very peaceful. It looked non-intrusive. However, it was expensive. Amberleigh was referred to us, so it had a very positive reputation. We liked the facility, and the care and attention the staff gave, but it has a buy-in option. The apartments were average, and the units that we saw were a little dated as far as the appliances. They didn’t looked like they had the best maintenance. When we were looking for a place for my dad, we found Amberleigh to be the best in the area. They have an amazing staff that greets each resident by name, they take the extra time to spend with the residents or just say a friendly hello. The apartments are the perfect size, food is wonderful with an amazing variety and plenty of activities and outings to go on. 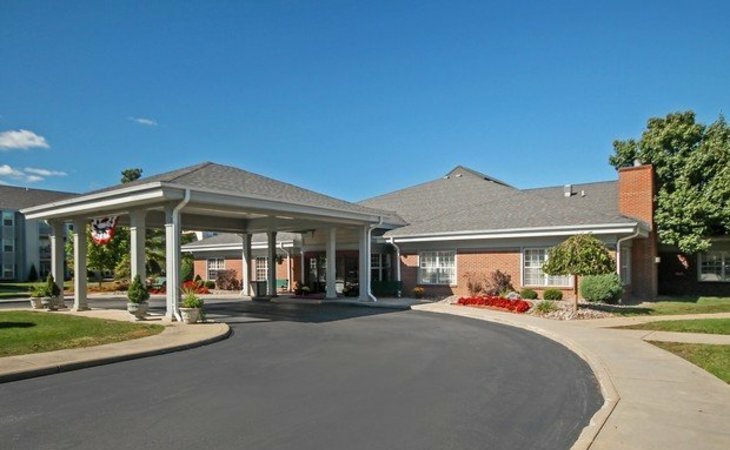 I would highly recommend Amberleigh to anyone looking for senior housing for their loved one. Amberleigh is tops! I selected this community because my parents were actually bored at home and needed others around to socialize with. The meals are very good and the staff is unlike anyothers we've met- so sweet and compassionate to seniors. The director has a life time committment to seniors and it shows. All staff under her direction are kind, know all of the residents names and go above and beyond the call of duty. It is clean, attractive but most of all a true place to call home for seniors. Amberleigh was very clean, but very expensive. The residents were very happy there. They have enough room for them to get around, and they have a library. The staff was very pleasant. The best feature was the hominess of the place. The rooms at Amberleigh were sufficient and nice, and you could pick either one or two bedrooms. The staff was very helpful, cooperative, friendly, and was able to answer all my questions, and it seemed to be a very nice place. If I was to move into a senior facility, I would pick this one. They've got an activity center with games, an exercise room, and a library. We moved my mother-in-law at The Amberleigh. It was close to the relatives that she has in the area. I have just been extremely pleased with everything. Everyone is very friendly and the facility is beautiful and it's well taken care of. The food is good. We really felt that she is safe there. There are lots of activities for the residents. It's just a wonderful place and I am pleased with it. I would definitely recommend this facility. When my grandmother was alive, she lived at Amberleigh and was cared for by their staff. I visited often and she was always happy and never had a complaint against the facility or the staff. The location was clean and friendly, and had a certain element of class, unlike some other senior home care agencies which were dirty or looked old. The staff was well trained, and knew what they were doing, and were always kind and caring towards visitors, and most importantly, residents. The quality of care was well worth the price we paid to have my grandmother there, because there is no price to put on good and loving care. One of the most important things there was the food! My grandmother loved good food, and if it weren't for Amberleighs good meal plans (not as good as a home made meal, but still great!) then we would have been very hesitant to put her there. All in all, Amberleigh is a great facility with a caring and knowledgeable staff that are concerned for your loved ones! My mother is in memory care. The staff are super-kind, patient, understanding, and resonsive. I feel reassured knowing she is being well taken care of. What should caregivers and potential residents know about The Amberleigh?